Over the last few years cameras have become smaller while the image quality has increased. The newer GoPro cameras can even record in 4K Ultra HD resolution allowing everyone to produce high quality videos. But GoPro’s are intended to be used in while you’re doing sports and outdoor activities which causes a lot of unwanted camera movement and shake. This means that even in the highest image resolution the video will not look professional because it looks extremely shaky. To create more stable video footage you will need a gimbal that counters any unwanted camera movement. A gimbal will make it look as it your GoPro is floating in the air. Even when you are running and recording with one hand. In this guide we will explain how a gimbal works and what you need to need to look for in a gimbal. Then we will look at our top recommendations with their pros and cons. Axis: The first important thing to look for in a gimbal is how many axis the gimbal stabilizes. The most popular gimbals on the market are 2-axis and 3-axis gimbals. For our GoPro Gimbal recommendations we have picked 3-axis gimbals. These can stabilize movement on more axis than a 2-axis gimbal resulting in more stable video footage. If you want to learn more about the different axis we have included an explanation with illustration about the different gimbal axis below. Battery life: A gimbal uses motors to counter any movement and these motors use power. That’s why gimbals use batteries. A gimbal with good battery life is preferable over a shorter battery life but if the battery can be easily swapped you can always keep on shooting. Most gimbals last around 4-5 hours per battery charge. Ease of use: Your gimbal should be easy to use so you can focus on shooting high quality, stable video footage. The gimbals we picked on this guide are easy to setup and use and don’t require long and complicated calibration procedures. Build quality: Build quality of a gimbal is another important aspect to consider. A plastic gimbal that easily breaks, or low quality noisy motors can both prevent you from shooting high quality videos. That’s why we picked durable, high-quality gimbals in our guide. So you can focus on shooting video without worrying about your equipment. How Does a Gimbal Work? 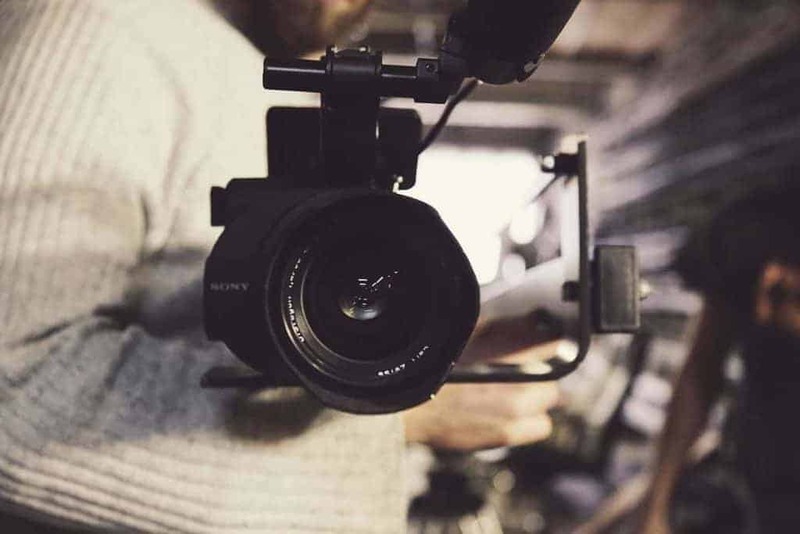 A gimbal works by monitoring sudden movements by the camera operator and countering that using the brushless motors to stabilize the camera and prevent camera vibration or shake. This allows the camera to seem as if it is floating in the air, even when you are shooting handheld while walking/running. With the guidance of algorithms the gimbal is able to notice the difference between deliberate and unwanted camera movement. A 3-axis gimbal stabilizes movement on three different axis. The picture below illustrates the different axis of a 3-axis gimbal. Usually gimbals have multiple shooting modes where you can choose to lock or stabilize different axis depending on the shooting conditions. Number five, and the cheapest gimbal, on this list is the Zhiyun Z1-Pround. This 3-axis handheld gimbal has a built-in independent IMU (inertial measurement unit) that powers the fast response, high torque brushless motor. The gimbal has a 2000 mAh high-capacity battery that last for around 10 hours, after which you can charge the gimbal with the supplied USB cable. The rotation angles of the gimbal are: up to 270 degrees tilt working angle, 90 degrees roll working angle and 270 degrees vertical heading working angle. The Z1-Pround is able to shoot in three different modes. Heading following mode, locks pitch and roll and smoothly follows the direction of the handheld. Locking mode, pitching and roll are completely locked. And Heading and Pitch following mode, this mode locks the roll without locking heading and pitch. The gimbal is fitted with an LED indicator to indicate the current shooting mode. This gimbal is compatible with all GoPro Hero cameras. The gimbal can still be used if you use a battery BacPac on your GoPro to extend the camera’s battery life. There are also two downsides to this gimbal. Out of the box it’s not always calibrated correctly and sometimes you will need to do a firmware update. Luckily, there are lot’s of resources online like YouTube videos to help you do this. The second downside is that if you use a GoPro with LCD screen the screen will be partially blocked by the gimbal. The fourth on this list is the Feiyu Tech G4. 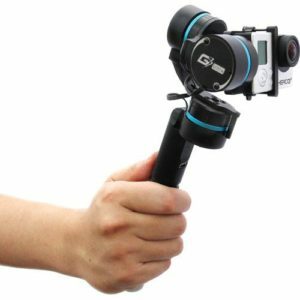 This handheld gimbal with 3-axis stabilization allows you to capture stabilized video with your GoPro Hero 3, 3+, 4, 4 Black and Hero 5. As well as other action cameras with the same size (between 1.3 and 1.8-inch tall) like the Xiaomi Yi. The G4 gimbal has 320 degrees of Pan/Tilt rotation and up to 100 degrees of Roll rotation. The gimbal is easy to use since it has only one button and can be operated with one hand. You can choose to lock the camera on all three axis, or by clicking the button to select the other modes where the GoPro will follow smoothly as you pan and tilt the handle. Feiyu have also released two accessories to enhance the functionality of this GoPro gimbal. The bottom of the gimbal is threaded so you can attach a Feiyu carbon fiber extension bar to use it as a stabilized selfie stick or for shooting over crowds. The other accessory is a wired remote control. You can use this remote control to control the pan, tilt and roll of the gimbal while it’s on an extension bar. Our number 3 GoPro gimbal is the Feiyu G3 Ultra. This is by far the most sold gimbal on the market because it delivers excellent value for the price. The Feiyu G3 Ultra is made of a durable brushed metal with a single button to control the gimbal modes. The three modes are heading following mode, heading and pitching following mode and lock mode. The LED indicator on the gimbal will indicate what mode you are currently in by a single flash, double flash or staying on constantly. The G3 Ultra has 90 degrees roll, 300 degrees pitch and 300 degrees heading. The gimbal is compatible with the GoPro Hero 3, Hero 3+, Hero 4 and Hero 5 without the waterproof GoPro case. This gimbal does NOT fit the GoPro Hero 4+! 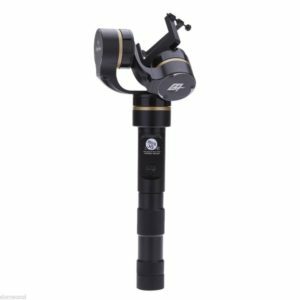 Number two on this list is the EVO GP 3-Axis Handheld Gimbal. The EVO GP uses high power, high torque motors to deliver an unparalleled level of stabilization performance and camera feathering. 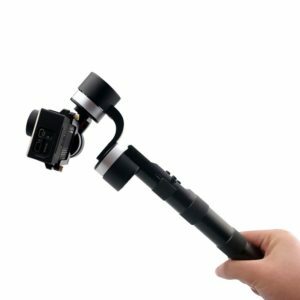 This gimbal is compatible with all GoPro Hero models to help you produce smooth, pro-quality and cinematic like footage without a complicated setup or calibration procedure. The gimbal can be used in four different shooting modes. Heading Follow Mode, Heading/Pitch Follow Mode, Inverted Mode and of course the Lock Mode. The EVO GP features a very robust design with a built-in charging cable to extend your GoPro’s battery life. The mounting tray also allows you to use the GoPro LCD bacpac and battery bacpac if you want to. The gimbal is made of CNC alloy and is backed by a 1 year USA Parts and Labor warranty. The gimbal also includes two Li-Ion batteries which are good for 4-5 hours of battery life each. 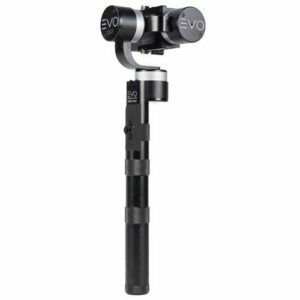 Our number one, and in our opinion the best gimbal for GoPro cameras, is the EVO GP-Pro. This gimbal is the PRO version of the EVO GP featured above in this guide. In terms of stabilization performance and build quality the two are very similar. The EVO GP-Pro uses high power, high torque brushless motors to produce unparalleled stable, high quality video footage with any GoPro Hero model. It even supports GoPro camera accessories such as the LCD bacpac and battery bacpac. Shooting stable video can be achieved without any difficult setup or calibration procedures because the EVO GP-Pro is so easy to use. You can use this gimbal in four different dynamic shooting modes. Heading follow mode, heading lock mode, heading/pitch follow mode and inverted mode depending on the situation. 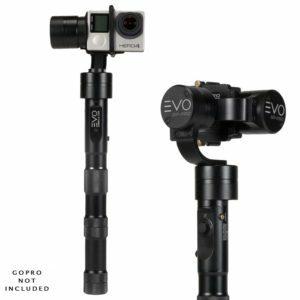 The EVO GP-PRO is made of aircraft grade CNC aluminum, is backed by a 1 Year USA parts and labour warranty and has a built-in charging cable so you can extend your GoPro’s battery life. But what is the difference between the EVO GP vs. the EVO GP-PRO? The GP-Pro has a 1/4-20 threaded battery cap on the handle. This allows you to mount the gimbal to an extension pole or a regular monopod/tripod. The GP-Pro has a 4-way thumbstick. This allows you to control the pitch, roll and pan of the gimbal with more precision. In lock mode you can also manually control the left to right panning with this thumbstick. The GP-Pro is able to pass the audio and video output signal from your GoPro to the 3.5mm A/V output port on the handle of the gimbal. This signal can be used to feed a signal to an external field monitor so you can (p)review your shots. The GP-Pro uses updated motors and position encoders. If you don’t need any of these four Pro features then we recommend the regular EVO GP (#2 in this guide). That gimbal offers similar stabilization performance at a lower price. And that concludes our guide! Hopefully you know more about gimbals, found the right one and are able to shoot more stable video footage.